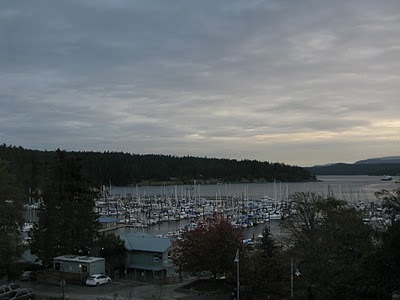 We took a quick overnight trip up to Friday Harbor on San Juan Island this weekend and stayed at Friday Harbour House. We ended up being the only car on standby to not make the early evening ferry and had to wait until much later, thank goodness for Glutino Pretzel Sticks and Justin's Peanut Butter Packets. So we called ahead to ask if they would first be able to make us a gluten free meal and if the kitchen would even be open by the time we made it to the island. Luckily, they were able to do both! One of their servers actually has Celiac's so she was able to recommend the best choices on the menu to me over the phone. We got in just as their kitchen was closing and the brought us a wonderful gluten free meal up to our room. The next day was pretty brief on the island but we stopped by Kings Market which had a decent selection of gluten free snacks. 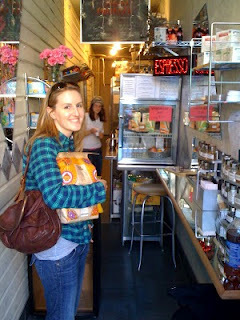 We also stopped by "The World's Skinniest Latte Shop" also known as Tight Squeeze. I hadn't planned on getting anything until I noticed that they had a huge variety of alternative non-dairy milks! I noticed, rice, soy, oat, almond, hazelnut, and my all time favorite coconut milk! So I got a coconut milk latte and wow, it was delicious. I'm already pumped to go back to San Juan Island, just so I can go get another coconut milk latte!